I create music, poetry, books and art that explore our existence, helping us remember who we are. Click here to download a FREE music meditation & printable PDF! Sign Up to receive monthly updates about releases, new projects and events! Click here for your free music meditation & digital poetry print! I prefer the aural flavors of Radiohead, Massive Attack, AIR, Pink Floyd, and David Bowie with a splash of Yusef Lateef and John Coltrane. You’ll hear threads of them in my music. I’m tapping into the astral when I create with sound. Never thinking. Always feeling. I love to work in alternate tunings such as 432hz and 444hz. I feel those tunings are harmonious with the Universe, the body, and the Earth. John Lennon, Paul McCartney, Roger Waters, and many more have all recorded and toured in these tunings. We all agree on something, somewhere. A vibe, an essence… a knowing. We are music. We are endless. We are everything. I create musical environments that weave traditional and astral composition in alternate musical tunings laced with binaural frequencies that change the way a person receives the visual mediums of film and television. My compositions create a true emotional connection to story and branding by evoking embodied relaxation, engagement, or other emotion by using tunings and frequencies that correspond to natural brainwave states. 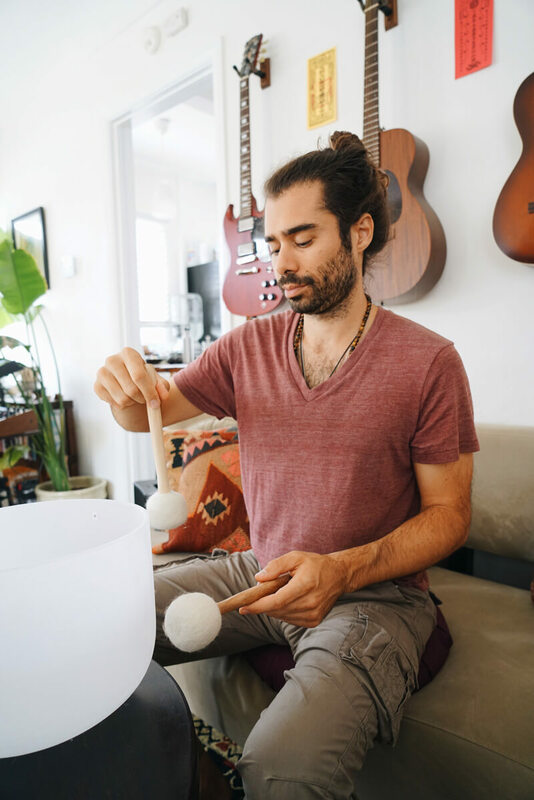 It can sound like any genre of music, but the feeling is completely different—true positive connection is created and sustained. I mix these compositions in ATMOS surround sound to create a fully immersive environment for the viewer that will leave them intimately living inside a director’s world. In interviewing a range of guests including healers, authors, shaman, spiritual teachers, therapists, and philosophers Greg explores existential questions that face us all, offering alternate perspectives on how we view our lives, careers, creativity, spirituality, and relationships. We’ll delve into metaphysics, esoteric subjects, philosophy, healing, and psychedelic experiences all culminating to universal truths and how each of us can live with our heart forward and embody joy in our lives. A timely thriller illuminating facts regarding the state of the world’s energy crisis, climate change, and the quandary of nuclear energy – inspired by events in Fukushima, unexpected earthquakes across the planet, and the deterioration of nuclear power plants worldwide. “A suspenseful and entertaining disaster novel. A claustrophobic and anxiety-producing thriller that will keep readers counting down to the final second." Poetic musings of my soul seeking and receiving as I question existence, relate it to the modern world, and observe. Listen. Be. Trust. Love. A collection of musings about muses — a deep gaze into the brith of intimate relationships and their demise told through intergalactic poetic riffs. See through both sides. Two viewpoints arise. Risen as it was and cannot hide. Don’t abide. Look out with double vision. Seek casks of river reflection, perspective collective recollection. Jangle your soul until it’s empty. ocular telepathic change-agent boiling beaker—the shrill sneaker. Look out through both your eyes, double vision’ll arise, comprised of it all. Two in one. One in all. Everywhere I go I see poetry in visual forms. Black and white film allows me to capture the essence of what is. See the light in all things. I'm a multi-faceted creator living in Los Angeles, CA crafting works that explore social awareness and the human psyche – delving into the nature of reality, consciousness, and existential questions faced by many. I express my perspectives and perceptions through music, novels, poetry, art, & photography. For more than a decade I have worked as a music producer, sound mixer, and recording engineer for Snoop Dogg, Amy Winehouse, Patti LaBelle, and many other award winning artists, television shows, and feature films.